Saturday was the first Oakland Heritage Alliance tour of the season, and was focused on Francis Marion "Borax" Smith. 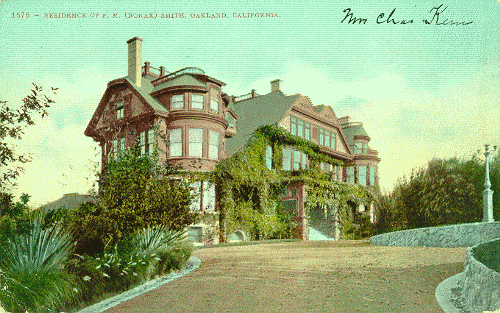 If you know anything about Oakland history, you've probably heard the name "Borax" Smith. After making a fortune in mining, Frank (as he was known to friends) switched his attention to real estate, and developed the Key System as a way to help develop and sell that real estate. I have to admit I went in to the tour kind of wondering what we'd see. After all, the Smith Estate was long gone, so what was there to look at? While the house itself is gone, there are still remnants of the Smith's legacy. We couldn't have asked for a more knowledgeable tour guide than Phil Bellman, a long-time OHA member who has been leading these tours since the 80s. We met just off Park Blvd. across from where the mansion was. The estate, known as Arbor Villa, was impressive. The grounds covered 50 acres. The house had 42 rooms, including 15 bedrooms, a bowling alley, and a miniature borax mine. While the house was on top of Ivy Hill, they also built an observation tower for what must have been stunning views. While all that is gone, buildings that were around the estate and that were built after the estate was sold remain. There are some remarkable buildings, designed by the likes of Julia Morgan, Bernard Maybeck, and Clarence Dakin. 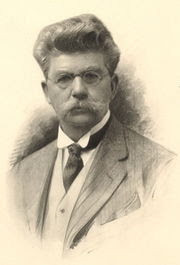 Frank and his first wife, Mary (Mollie) R. Smith were also known because of Mary's philanthropic work. Inspired by Benjamin Farjeon's Blade O'Grass, she started a home for "friendless" (i.e., orphaned) girls. Frank built a total of 13 cottages for the girls, plus the Home Club, which served as a community center, and turned over 34 acres to the Mary R. Smith Trust. A number of the cottages are still standing and are private residences now. Along with amazing architecture and history about Smith, there were various interesting tidbits of Oakland history on the tour. One was an old sidewalk stamp at the corner of East 24th St. and 9th Ave, dating back to 1902. Our guide mentioned it was the oldest sidewalk stamp he knew of in Oakland. I immediately thought of the Oakland Sidewalk Stamps blog, and quickly found one as old. (With a little more searching on the site, I found ones dating to 1901). But what's remarkable is how little else was there in 1902, so having a sidewalk out in the boondocks was a big deal. After the tour was over, I walked and biked more around the neighborhood. I checked out F.M. Smith Park further down Park Blvd., which includes a plaque about Smith, statues of mules, and a grave marker for Smokey - a good mule. The park was built on land donated by the Smiths. After getting some lunch and running some errands, I also stopped by a plaque in Trestle Glen that tells about the trestle built by Smith's Oakland Traction Company (a predecessor of the Key System). In 1893, they extended a streetcar line from downtown Oakland, up Park Boulevard, and built a large trestle across what was then Indian Gulch to carry picnickers to Sather Park. Mark Twain was one of the inaugural riders. The trestle lasted until 1906, when the streetcar was rerouted. "Borax" Smith died in 1931, and is buried in Mountain View Cemetery, along "Millionaires Row". Claremont Hotel - Built as a "destination" on the Key System by Smith's Realty Syndicate. Thanks for recapping the Borax tour, complete with great photos. We lived among corporate titans, who had great esthetic sensibilities. Thanks for the nice report on Saturday's Borax Smith tour! Note: Mary R. Smith was inspired to establish her cottages for "friendless girls" by the book Blade-o'-Grass by the English author Benjamin Farjeon -- a story of two English orphans. As for El Campanil, it was not the earliest reinforced concrete structure on the West Coast, although it was important in furthering Julia Morgan's career following the earthquake. Smith's borax refinery in West Alameda was built using Earnest L. Ransome's reinforced concrete method in 1889. It's believed to be the first reinforced factory building in the US. An even earlier building, the Arctic Oil Works in San Francisco was built of reinforced concrete about 1884. And later, the SF Ferry Bldg. was built using the Ransome method in 1896. Thanks for the clarifications, Phil. It was a great tour! I've updated the post to correct those points. I overlooked two important structures built of reinforced concrete by Ernest Ransome: the 1889 Alvord Lake Bridge in Golden Gate Park, well documented as the first reinforced concrete bridge in the US; and the 1894 Leland Stanford Jr. Museum, now the Cantor Arts Center at Stanford. I just took the Oakland Urban Paths tour you led. Great stuff. Thanks very much.